The Chinese Navy: How Big a Threat to the U.S.? Last month, delegations from the naval fleets of 14 nations met at the Chinese port of Qingdao to mark the 60th anniversary of the founding of the People's Liberation Army Navy (PLA-Navy). It was a chummy affair of joint exercises and processions at sea, overseen by white-clad officers in full regalia. In a speech there, Chinese president Hu Jintao trumpeted his country's emergence as a budding maritime power, while assuring foreign observers that China "would never seek hegemony, nor would it turn to arms races with other nations." Instead, Hu claimed, the retooled and expanding Chinese navy would lead the region into "harmonious seas." In response to China's gains  which include putting out three new submarines a year since 1995  neighboring countries have also set about beefing up their fleets. Just a week after the ceremonies in Qingdao, Vietnam announced its purchase of six kilo-class submarines from Russia. On May 2, the Australian government published a white paper outlining a twenty year, $74 billion plan to revitalize its navy so it could be ready, if need be, to counter a "major power adversary"  a thinly veiled reference to how some defense officials there imagine China's military project. "The front line of the Cold War may have been in Western Europe," says Andrew Davies, an expert on Asian military modernization at the Australian Strategic Policy Institute, a Canberra-based think tank. "But a future one could well be drawn through the western Pacific." A decline in American influence is at the core of the region's changing geo-political landscape. For decades after World War II, the U.S. authored the status quo in Asia's waters, with a series of naval bases from Guam to Japan, and a high-powered presence of marine corps and air-craft carriers to back up its interests with muscle. In 1996, when tensions between China and Taiwan bubbled over into threats of war, Washington was able to check Beijing's aggression by deploying two carrier battle groups off Taiwan's shores. That kind of move is unthinkable now, not just because the US is entangled in costly operations in the Middle East, but because of China's growing stature and military resources. "We were in a period that was essentially unipolar," says Davies. "Now the U.S. and China are going to have to reach some sort of an accommodation." Other nations in China's neighborhood are not holding their breath. Over the next five years alone, Asian navies will lavish an estimated $60 billion on upgrades and new technologies, outstripping all the combined spending of countries in NATO, excluding the U.S. Apart from China, the top Asian spenders include Japan and South Korea, nations that over the past 40 years relied on American military support to deter the communist states to their west. Now, Japan is due to launch its largest ship since World War II, a "Hyuga" class helicopter carrier  Japan's pacifist constitution forbids the use of carriers with more offensive aircraft  that is designed chiefly for anti-submarine warfare. Seoul paraded a similar 14,000 ton vessel at Qingdao. Of course, with many Asian countries bound together by their dynamic economies, few analysts expect a full-blown arms race that could disrupt the region's growth. Mike McDevitt, a retired U.S. admiral and director of the strategic studies division at the Center for Naval Analyses in Washington D.C., envisions a more tacit struggle for strategic supremacy, based on stealth and surveillance. "There'll be a capabilities competition between the U.S. and China going on for the foreseeable future," he says, with navies seeking to interfere with rival sea lines of communication, probing maritime borders with deep sea patrols likely involving submarines capable of bearing ballistic missiles. Two tense standoffs in recent months between American and PLA surveillance vessels near China's southern Hainan island may be an augur of what lies ahead. A new submarine base there gives Beijing a vital edge in the South China Sea, whose waters are contested by five other governments. The disputed Spratly and Paracel archipelagoes, which sit above reserves of natural gas, have been an ongoing bone of contention between China, Taiwan and Vietnam. Further afield, China and India, Asia's other rising giant, are locked in a protracted contest of influence over the Indian Ocean, with China setting up a "string of pearls"  or listening posts  from Burma to Pakistan. New Delhi has stepped up its own military ties with Hanoi in an attempt to keep Beijing busy in its own backyard. Strategic analysts stress there's nothing wrong with emerging nations like India and China improving their naval prowess to match their heightened role in world affairs. 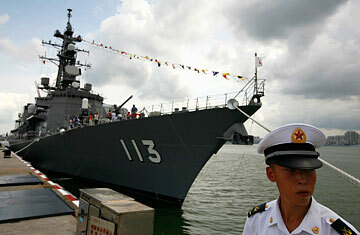 "It is logical that these countries will build navies and project their power," says Raja Mohan. "The question is how does this all get managed?" As of yet, there is no regional treaty alliance in place, no new diplomatic structures like NATO in Europe, for example, that could reflect or bring order to the shifting power lines of the Asian 21st century. Last year, Japanese prime minister Taro Aso floated the idea of an "arch of freedom," a security consensus threading together democracies like India, Japan and Australia, but its obvious anti-Chinese subtext meant the notion gained little traction. "Nobody is going to sign up to an actual containment policy," says McDevitt of the Center for Naval Analyses. For now, a cloud of uncertainty looms over the shape of things to come. Experts talk of China's maritime rise in the same continuum as that of the British Royal Navy in the days of Victorian empire, and the U.S. fleet during the Cold War. At present, China's naval capabilities are still that of a regional power  its own state planners aim for the PLA to finally have "risen" only in half a century's time. By then, the world could be very a different place. The Chinese navy could act as a stabilizing force  or a source of conflict that threatens its neighbors. "It should not shock us that they're going to be there, out and about," reckons McDevitt. "We might as well get used to it."